As a parent of color it is very difficult to find children’s books that reflect how diverse our world actually is. When we do find books, many of them are about historical figures, historical events, or rooted in surviving tragedies. 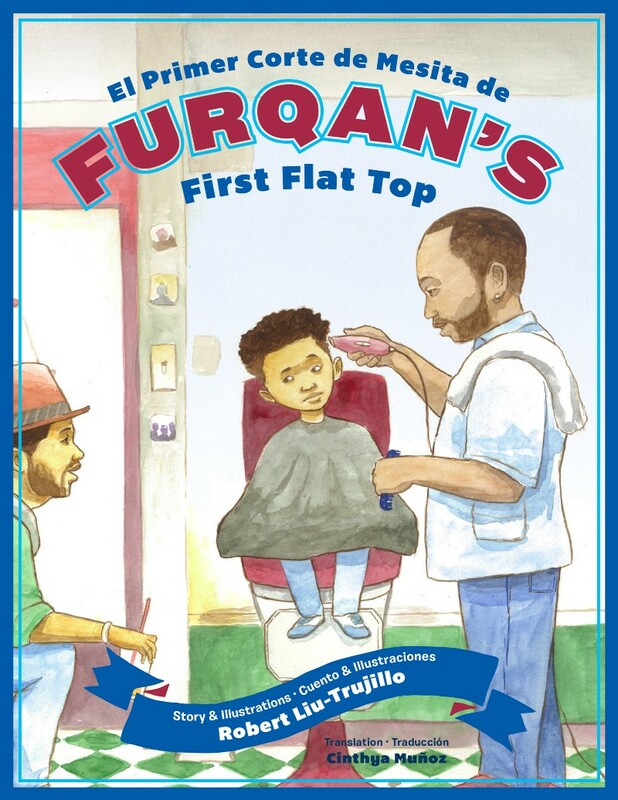 This is what makes El Primer Corte de Mesita de Furqan (Furqan’s First Flat Top) such a wonderful addition to the POC children’s book canon. What grabbed me most was that Trujillo was able to present the barbershop as both scary and amazing. In many cultures, for men, the barbershop is the one place where we can exercise our freedom. We can talk about what we want, laugh, argue, call BS on each other, and be role models for boys. Some of my fondest childhood memories are me, my uncle, and my youngest cousin eavesdropping on the older men: Jamaicans, Haitians, Cubanos, Boricuas, African Americans talking mess, discussing current events, and being vulnerable in a way they weren’t allowed to be in their other contexts. I also remember folks coming in to sell everything from bean pies to car batteries. It was better than any field trip I took in school. The art in Furqan is soft and warm, while the writing is complicated enough that a wide range of young readers (I’d say between 5 years old and 8 years old) can enjoy it. It is also a bilingual Spanish/English book, so even older readers can work on their Spanish. It helped me work on my Spanish as it presented words that I don’t use very often. My daughter devoured the book as soon as she got it. She frequently returns to it to practice her Spanish, and to see some reflection of, if not herself, then her cousins, friends, and other folks in her expanding world. It is still a chore to find #DiverseBooks, especially children’s books, but when we find something as charming and necessary as El Primer Corte de Mesita de Furqan, it is vitally important that we support it. Definitely need more books like this.